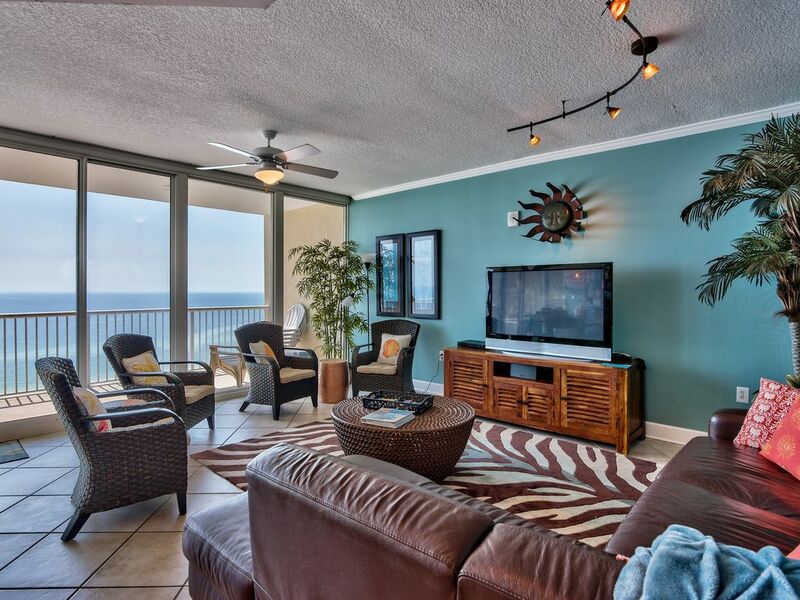 Sanibel complex #1705 (Gulf Shores) land in the Lap of Luxury, get your Ooh-La-La ON! Always last-minute specials if two weeks or closer to your trip. Just read the reviews and see for yourself! We provide excellent customer service and luxury unparalleled for this price, and the VIEWS are just incredible. **We do NOT force weekly so in peak seasons, you must either leave no gap between reservations - OR leave 3 nts or more since we have a 3-nt minimum. Ask if you're not sure about your dates, and I own three more identical condos in this same building for other date options** Condo is much larger than most 2-bedrooms with main room ALONE appx 600 sq ft and has uninterrupted views of the Gulf from your 30-foot wide WALL OF GLASS. Guests' favorite feature is the BONUS views of 9 mile Little lagoon to the back, views from bedrooms and entry hallway. ~ Simmons BeautyRest premium mattress on Master King Bed with quality linens for a deep snooze! ~ 30-foot-wide wall of FLOOR-TO-CEILING glass for sweeping views of the Gulf that takes your breath away - the photos can't do it justice! ~ Our balcony will quickly become your favorite spot for coffee or happy hour with its super panoramic views. Listen to the waves, read a book, watch dolphins play as you relax on top of the world! ~ Sonos Wi-Fi Speaker, free app on your smart device, stream wirelessly from your personal music library, favorite streaming music services, and over 100,000 internet radio stations from around the world. Satellite cable in every room on flat-panel TVs ~ A 9-mile long lagoon on the back side offers water views from every room ~ Granite in kitchen and also on dual-sink counters in bathrooms, leather sectional, fully loaded kitchen including ice-crushing blender and Keurig AND regular coffee pot, new NINJA ice-crushing blender ~ Two large, full baths and add'l half-bath in the hallway gives you FIVE bathroom sinks, no fighting for space to brush your teeth! ~ BEDS: 1 King ~ 1 Queen ~ 1 set of twin bunks in bunk room ~ No one over age 12 in bunks so max of (4) adults but sleeps 6 in beds ~ WE PROVIDE: Rolling cooler and rolling beach cart provided, plus 2 folding sand chairs. Also stacking washer/dryer and fully loaded kitchen. Co-owned by the Booth and Flynn families, who grew up in Mobile and Pensacola, respectively! Best view around with the 30-foot wide WALL OF GLASS - enough said! Locted on a narrow sliver of land where you don't have to fight for beach space - yet you are back in town with all the stores and restaurants in 3 minutes flat. Views out both sides of the building - lagoon behind us and Gulf in front of us. Water views everywhere you turn. 30-foot wide wall of glass gives exceptional GULF views - plus additional LAGOON views out your bedrooms and walkway on north side of building. See all the way to Mobile Bay! covered and open - plenty! Luggage carts available. not beach towels - just bath linens. Bring your own beach towels please. Everything you need except groceries! We even provide basic spices. Satellite Box with Pandoar, Netflix, etc. 30-feet wide - great views! Six in beds but NO ADULTS in top bunk so max of five adults. Beautiful condo and beautiful view. If you are on the fence deciding where to stay, the wall of glass and views alone---should close the deal on this home. All high end, great electronics, loved the SONOS speaker. Close to beach and my wife loved the well stocked kitchen. Owner easy to reach and quick to reply to questions. Lagoon behind was a plus, went fishing and just another set of views we didn't realize we were getting, BONUS! Completely Blown away !!!! The owners are very helpful and made sure everything was perfect! I dont even know where to start, hands down this property is amazing. Super clean and the view is breathtaking!!! everyone is so sweet and nice, and helpful! Dana and robin truly care about your stay and they do all they can to make your stay amazing! the pictures seriously don’t do this place justice! Gulf shores is my vacation spot and I’ve stayed in many places but none compare to here! this is now my vacation go to!! Thank you guys so much!! Dana- we loved our time at your condo it was perfect. Our first time visiting Gulf Shores and we fell in love with the area. Booked for a month next winter and we cannot wait. This place was fantastic. I have used a few rental proprieties on VRBO even internationally, and this might be the best I've ever stayed at. We went with our two year old son who had a ball. Everything about the apartment was excellent, very clean, comfortable beds, well stocked kitchen, amazing deck with incredible views, and an incredible sunset at the dock right behind the apartment. I will stay here again next time! We have stayed at the beach every year twice a year. This by far is my favorite condo. We willbestaying here for now on. Loved every second of our stay. We are close to everything - with Waterville Amusement Park, The Zoo, putt-putt, dolphin cruises, marinas, movie theatre, outlet mall, souvenir shops, and 25 restaurants and bars all within a few minutes' drive. Super Wal-mart just 3.5 miles away. ** Rates ALWAYS subject to change and HOLIDAY/FESTIVAL premiums may apply, but once we quote you in writing, your quote is good for 48 hours. ~ we sleep six in beds but a MAX of 4 adults due to bunks ~ No Spring Breakers or student groups, and any all-adult groups must have ALL guests minimum age 23. ~ Any dates 2 weeks out or less MAY qualify for last-minute discount. ~ Except for peak summer and spring break, any stays that are weeknights ONLY (Sun, Mon, Tues, Wed nights) and do NOT include Thurs, Fri, Sat nights MAY qualify for a discount. ~ We do NOT force weekly, but that we don't allow vacant nights in peak season. So if it's a 6-nt gap, for example, you may not take 5 nights unless it's off/shoulder season, OR we approve in advance. We are more flexible with gaps in off-season.